The Summer Palace in China is an extensive ensemble of hills, gardens, lakes and palaces, that was originally built outside the city of Beijing. Today it serves as a recreational park and has become a popular tourist destination, for both the Chinese and foreign travelers. It is our 6th stop in the series Journeys to Discovery. The total area of the Summer Palace encompasses a total of 1.1 square miles or 2.9 square kilometers. Three-quarters of the complex, is compromised of water from the lakes. 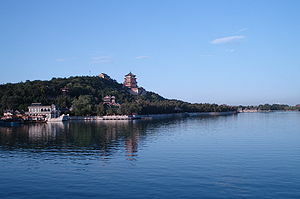 The Summer Palace is located 13.17 miles or 21.2 kilometers from the heart of the Chinese capital. This equates to a travel time of 39 minutes from the Forbidden City. 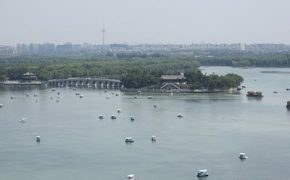 The attractions of the Summer Palace can be divided into six different scenic areas. They are the Halls, Longevity Hill, Kunming Lake, the Farming and Weaving Picture Scenic Area, the Long Corridor, and the Central Axis area. 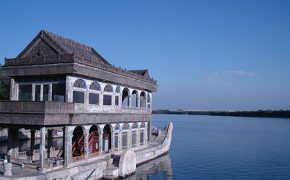 In 1998, UNESCO included the Summer Palace on its World Heritage List. 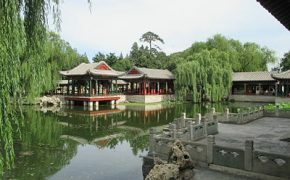 It identified the site as a masterpiece of Chinese landscape garden design. The natural landscape of hills and open water is combined with artificial features such as pavilions, halls, palaces, temples and bridges to form a harmonious ensemble of outstanding aesthetic value. The Summer Palace is mainly dominated by Longevity Hill and Kunming Lake. The central Kunming Lake, covers some 540 acres (2.2 square kilometers) and is entirely man made. The soil excavated by hand, was used in the creation of Longevity Hill. The latter is about 200 feet (60 meters) high and has numerous buildings built in a sequence. The front part of Longevity Hill was endowed with magnificent halls and pavilions that number over 3,000 rooms. The back hill as a contrast, is a simple display of natural beauty. The origins of the Summer Palace can be traced back to the Jurchen-led Jin Dynasty in 1153. The fourth ruler, Wanyan Liang who reigned from 1150 to 1161, moved his capital to Yanjing. This city would later evolve into the present day Beijing. 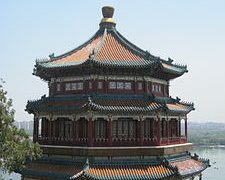 Standing atop the Longevity Hill, the Tower of Buddhist Incense is the highest building in the Summer Palace. It was this ruler that would order the construction of the first palace in the Fragrant Hills and Jade Spring Hill, located in the northwest part of his new capital. Around the year 1271, after the Yuan (Mongol) Dynasty also established its capital at what was known as Khanbaliq (Beijing), a waterworks project was designed and built in the area. This would later become Kunming Lake. The aim was to provide a reliable supply of water for the capital. 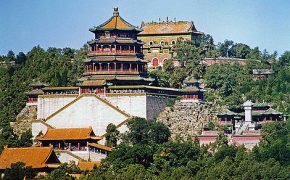 Later in 1494, the Hongzhi Emperor of the Ming Dynasty has a temple built in front of Jar Hill, which was later renamed Longevity Hill. This structure would eventually be abandoned and fell into disrepair. The Zhengde Emperor who succeeded to the throne, built a palace on the banks of the Western Lake and turned the area into an imperial garden. Both he and the Wanli Emperor who reigned from 1572 to 1620, relished taking boast rides on the lake. The construction of the Summer Palace itself started around 1750 by the Qianlong Emperor. He decided to build a palace there, to celebrate the 60th birthday of his mother, the Empress Dowager Chongqing. He had the Western Lake expanded to create two more lakes known as Gaoshui and Yangshui. He would name the three lakes collectively as Kunming Lake. Some 150,000 peasants would dig a lake by hand that would end up being 6 miles long. They would also shape an incredible landscape, that surrounded this new body of water. The excavated earth was used to enlarge Jar Hill, which was now renamed Longevity Hill. The peasants would now build up the hill some 200 feet high and then create buildings, built out of teak, enhanced with bronze and gold. 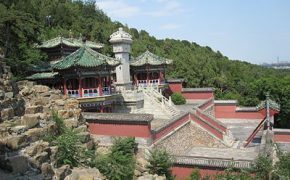 The Summer Palace would be completed in the year 1764 at a cost of 4.8 million silver taels. It was at first named Qingyiyuan, which translates into Garden of Clear Ripples. The grounds around the buildings were a luxuriant garden, for the imperial families to relax and entertain guests. 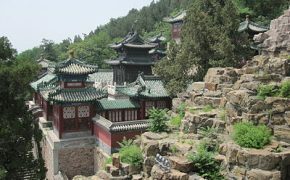 A number of the buildings and temples were taken from other sites around China, to complete the almost magical scenery of the extensive gardens. 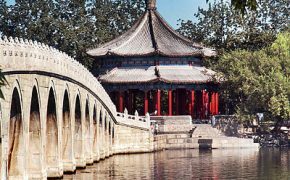 The arrangement of the Summer Palace was attributed to a legend in Chinese mythology. The story is about three divine mountains in the East Sea. The three islands in Kunming Lake were built to represent these mythological places. Kunming Lake itself, was modeled after the West Lake in Hangzhou. 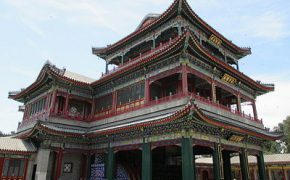 Many of the architectural features in the palace were also built, to resemble various famous places around imperial China. A model of the whole of China, created on just 12 square miles. The centerpiece of the Summer Palace was the Great Temple of Gratitude and Longevity. 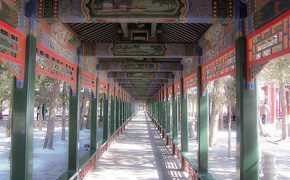 There was also the Long Corridor a 2,297 (700 meters) which was decorated with intricate artistic decorations. The Qing (Manchu) Dynasty began to decline following the thirty year rule of Daoguang Emperor. His reign from 1820 to 1850, were the years when China was falling ever further behind the West, in technological advances. 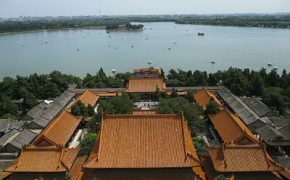 After his death, the Summer Palace began to be neglected and the architectural features on the three islands, were ordered to be dismantled. They had become too expensive to maintain. The turning point arrived in 1860. At the end of the Second Opium War, the British would burn down the nearby Old Summer Palace, known as Yuanmingyuan. Over 200 halls of teak and gold leaf would be burned. A soldier wrote at the time that you can scarcely imagine the beauty and magnificence of the places we burned. It made ones heart ache to burn them. The destruction of the palace was ordered by Lord Elgin, the British High Commissioner to China. The reason given for the command, was the torture and killing of two English envoys, a journalist and their escorts. The Summer Palace itself, was seriously damaged and looted at the same time, by both the British and the French. The wanton destruction of large sections of the Summer Palace, is still remembered among many Chinese and is considered by them, to be a crime against their culture and history. The next evolution of the Summer Palace would result from an unusual chain of events within the royal family. The reign of the Guangxu Emperor from 1875 to 1908 comprised the 11th ruler from the Qing dynasty and the 9th one to rule over China. He was strongly under the influence of his aunt, the Empress Dowager Cixi from 1889 to 1898. 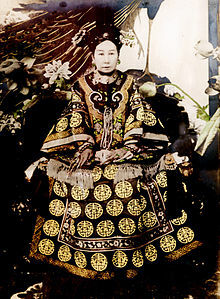 Empress Cixi had been the mother of the previous Emperor and was his regent. She would never really relinquish power from this point. When her son died at 19, she would appoint a nephew to rule, but would maintain the real political power in her own hands. For the first time in a thousand years, China was being ruled by a woman. She would become known as the Dragon Empress. Empress Dowager Cixi wanted to restore the Summer Palace to what it was like during her youth. To accomplish this task, a great deal of money would be needed. In 1884, she would embezzle the equivalent of 50 million USD (United States Dollar) intended for the Chinese navy, to be used instead in the restoration of the Summer Palace. From the years 1884 through 1895, the Empress would use 22 million silver taels, an incredible fortune in the ongoing building project. The enormous expense, forced most of the construction to take place on the buildings in front of Longevity Hill and the dams around Kunming Lake. The Tower of the Fragrance of the Buddha was by far, the most expensive building. At a time when a comfortable Chinese peasant earned just $0.15 USD a day, the Empress spent more than a million dollars on the gold roof finial alone. A great deal of the national wealth of China was used in reconstructing and enlarging the Summer Palace, in time for the 60th birthday of Empress Cixi in 1895. It would consume a seventh of the Chinese budget during these years. It is noteworthy to remember, that during this period some 20 million peasants would starve in the outlying provinces, as the Empress lived a lavish and extravagant lifestyle. She concealed the fact that court expenses, were costing the Chinese Treasury some $20 million USD, a year. The royal staff at the Summer Palace alone, numbered a thousand. The cost of just one of her elaborate meals, would feed 50 peasants for a month. The Empress would insist on 128 separate dishes, for both lunch and dinner. However, she would mostly dine on only a few favorites. The Empress Dowager would also accumulate some 20,000 gowns over the years. The Summer Palace had taken its present name (Yiheyuan) during its reconstruction in 1888. The same year, that the Empress moved her imperial court there for good. The Empress Cixi would have constructed at the heart of the complex, China’s largest theater. Its magnificent stage alone, would comprise three stories. Personal performances for the Empress would be presented in a continuous manner. In 1894, China and Japan would go to war over Korea. Without a modern navy, the Chinese forces were destroyed, by the rapidly modernizing Japanese. The Empress on hearing the news, simply complained the whole episode, ruined her 60th birthday celebration. At the Summer Palace, the Empress Cixi restores an ornamental marble boat, to honor the Chinese patriots,who had collected money for the navy. When her nephew the Emperor Guangxu initiated the Hundred Days’ Reform to modernize China, he was stopped by the Empress Cixi. She instead launched a military coup and seized the throne for herself. He would be imprisoned until his death in 1908, likely by poisoning. Her victory over the reformers inspires a group of Chinese ultra nationalists, who become known as the Boxers. They would soon stage an uprising. In 1898, they begin to kill Chinese Christians. In 1900, against the counsel of her advisers, she orders all foreigners in China to be killed. The Boxers subsequently kill, thousands of foreign nationals. This would lead to Western military intervention, once again. Countless thousands more Chinese citizens would be killed, due to the allied assault on the Chinese capital. 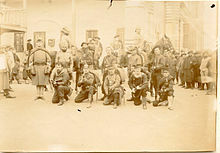 Representative U.S., Indian, French, Italian, British, German, Austrian and Japanese military and naval personnel forming part of the Allied forces during the Boxer Rebellion. In 1900, towards the end of the Boxer Rebellion, the Summer Palace would suffer a great deal of damage. Parts of the complex would suffer being consumed by fire, once again. The forces of the Eight-Nation Alliance would destroy the imperial gardens. They would also steal countless historical artifacts and works of art. The Empress Cixi had fled ahead of the invasion. 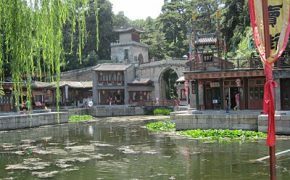 When she returned, the Empress orders the Summer Palace to be restored,with most of the work completed between 1902 and 1905, in time for her 70th birthday. The Empress had been placed back on the throne by the Western powers, as a stabilizing force in China. Her political power over the nation however, was greatly reduced. She had largely become a figurehead, over an increasingly restive nation. She would die six years later while in residence. The throne would be left to another nephew. Empress Cixi would expire only a day, after choosing him as her successor. 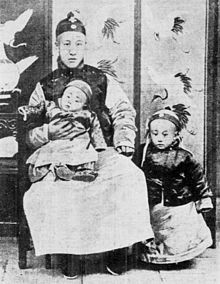 The three year old Puyi, would be China’s last emperor. Soon the tradition of monarchy, which had lasted some 2,000 years would come to an end. Following his abdication in 1912, the Summer Palace became the private property of the former imperial family. Two years later, the Summer Palace would become open to the public, with the sale of entry tickets. After Puyi was expelled from the Forbidden City by a warlord in 1924, the Beijing municipal government, would see to the administration of the Summer Palace. It was soon turned into a public park. After the Communist victory in 1949, the Summer Palace would briefly house the Central Party School of the Communist Party of China. Many of Mao Zedong’s friends and other noteworthy members of the Communist Party, would also take up residence. Since 1953, there have been numerous renovations and restorations projects at the Summer Palace. Today, it is open to the public as a park and a major tourist attraction for the Chinese and for numerous foreign tourists. From the downtown Beijing area, the Summer Palace it just 9 miles (15 kilometers) away. 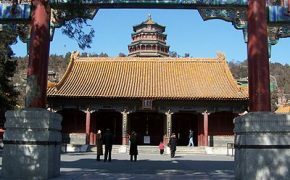 Tourists can enter the Summer Palace from the North Palace Gate, the East Palace Gate, the West Palace Gate or the New Palace Gate. One can either take Subway Line 4 or Subway Line 16. If a visitor would prefer to travel by bus, there are a number of them one can take, depending on the Palace Gate they wish to enter. There are two seasons of operation. The summer schedule runs from April 01, to October 31. The Summer Palace will be open from 6:30 am to 6:00 pm (18:00). The scenic areas are open from 8:30 to 5:00 pm (17:00). The winter listing is from November 01, to March 31. It will be open from 7:00 am to 5:00 pm (17:00). Scenic areas are open from 9:00 am to 4:00 pm (16:00). Your tour at the Summer Palace will last at least 3 hours, to adequately visit the most famous sites. 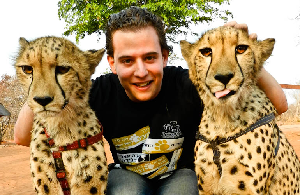 The general entrance fee is 30 (CYN) during the summer schedule and 20 (CYN) during the winter one. This is the equivalent of $4.35 USD and $2.90 USD respectively. The combination ticket which includes the entrance fee and the most popular sites of Dehe Garden, Tower of Buddhism Incense, Wenchang Hall, Suzhou Street and Danning Hall, sells for 60 CYN, the equivalent of $8.70 USD in the summer and 50 CYN or $7.25 USD, in the winter. Children under 3.9 feet or (1.2 meters) are admitted for free. Seniors that are older than 70, are admitted for half price, by showing a valid identification or passport.